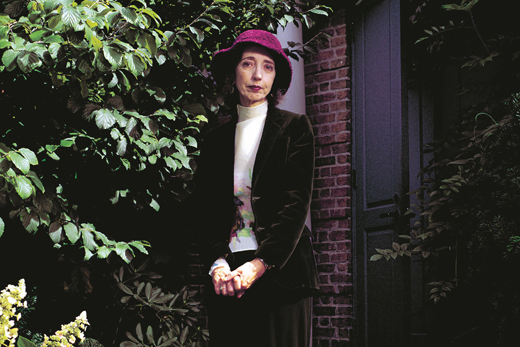 Literary icon Joyce Carol Oates speaks at Emory on Friday as the keynote for the Decatur Book Festival. Photo by Jeff Sciortino. The 2014 Atlanta Journal-Constitution Decatur Book Festival kicks off with a keynote address by American literary icon Joyce Carol Oates at 8 p.m. Friday, Aug. 29, at Emory’s Schwartz Center for Performing Arts. Following the Friday keynote at Emory, the festival continues in downtown Decatur on Saturday and Sunday with multiple events and author presentations, including several from Emory authors. Oates will launch her new short story collection, “Lovely, Dark, Deep: Stories,” a collection said to display Oates’s “magnificent ability to make visceral the terror, hurt, and uncertainty that lurks at the edges of ordinary lives.” Tickets are required for the keynote event and are sold out. Emory is a major sponsor of the weekend event, which is the largest community-based independent book festival in the country, offering lectures and book signings from more than 300 authors. One of the most popular tracks during the weekend is Emory’s Raymond Danowski Poetry Library Track, which features 16 poets this year. They include Emory professors Natasha Trethewey, previous U.S. poet laureate and Pulitzer Prize winner; Jericho Brown, American Book Award winner; and Kevin Young, also an American Book Award winner. Book signings have been scheduled for 11 Emory faculty members in the festival's Emory tent. 5:15 p.m.–Jericho Brown, assistant professor of English and creative writing. 3 p.m.–Kevin Young, Atticus Haygood Professor of Creative Writing and English and curator of the Raymond Danowski Poetry Library at Emory. The festival also will include readings by 16 Emory alumni authors on a variety of subjects. See the website for a complete listing of authors and times. Other Emory partners include the Divisions of Communications and Marketing, Emory Libraries, the Michael C. Carlos Museum and Museum Bookshop, the Division of Development and Alumni Relations, the Schwartz Center for Performing Arts and Arts at Emory, the Creative Writing Program, the Center for Faculty Development and Excellence, the Emory Alumni Association, and Barnes and Noble. For the second year, the festival will feature the art | DBF program, connecting festival patrons with artistic and cultural opportunities in metro Atlanta. The program includes a variety of local arts organizations that will exhibit, present, perform and activate individual spaces; performances and presentations by the Decatur High School Performing Arts Center; a Community Bandstand outdoor performance space for short format music and storytelling; pop-up performances throughout the festival grounds; and artist installations. Festival parades will be held on Saturday and Sunday mornings during the weekend event. On Saturday at 9:30 a.m., Music in the Park ATL will lead the “Whistle Blowers Parade” during which kids of all ages are encouraged to bring whistles, kazoos, and other homemade instruments and join the first march to the Children’s Stage. On Sunday at 11:30 a.m., attendees are invited to dress up as their favorite character from “The Wizard of Oz” and again march to the Children’s Stage, where actors from Serenbe Playhouse and puppets from Atlanta’s Center for Puppetry Arts will perform a scene from the beloved story. A complete schedule of authors, programs and events is available at www.decaturbookfestival.com.